Sometimes you need to move an entire day forward, pushing all future plans forward as well. We call this "Bumping". When you bump a day, only certain types of plans get moved. 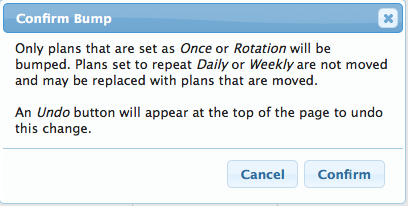 One time plans and rotations will be moved, but daily or weekly plans will not. Schools that operate on a weekly schedule may have a class that meets every Tuesday (ex. a special such as Art or Music), that generally wouldn't be bumped to the next day. However if you school uses a rotation then those classes would be bumped for off days and meet the following day. After clicking "Bump", you will get a message confirming the action. After clicking "Confirm", all the plans for that day will move forward, as well as pushing any future plans forward a day. If there is an unexpected day you need to bump (such as a Snow Day), you can mark that and bump at the same time. Click on the cog icon and select "Off Day". 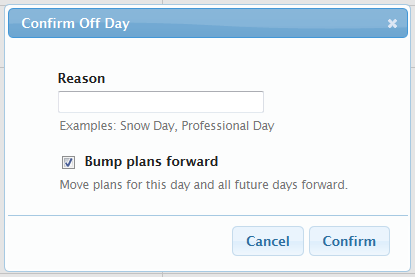 You can enter a reason for the Off Day, such as Snow Day, and also select the box for bumping. If you bump a day accidentally, you can undo it by clicking the "Undo" link that appears at the top of the page (below the planbook title). If you've previously marked holiday and vacations using the Off Days feature, those days will be skipped when bumping. Weekends or any other days that aren't part of your calendar will also be skipped when bumping.